Find out if you need to pack your flip flops or several ponchos for the Worthy Farm festival. If this week's unsettled weather is anything to go by, then the outlook for our UK summer isn't looking too great. And - while we've almost come to except it tipping it down while we're stuck at home or at work - rain during a festival is something that can totally kill your vibes, often leaving you completely drenched and with nowhere to sit. With Glastonbury 2016 - which takes place from 22-26 June - just over a month away, our thoughts have already turned to whether it's going to be a complete scorcher, or a total washout. Well, according to AccuWeather - which provides extended weather forecasts for the region of your choice - it's looking pretty darn good. 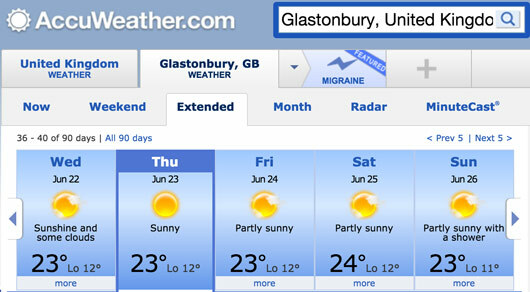 It's predicted to stay between 23 and 24 degrees throughout the Somerset Festival, save a few "clouds" and "showers". And it's decent news for those having to pack up while nursing a hangover on the Monday morning, as according to the website. It's going to be 23 degrees, with some clouds too. Obviously, forecasts get a lot more accurate the closer you get to an event, but for now, we'll take it! Plus, anything's better than a complete washout right? Come rain or shine, obviously we highly recommend you take wellies, a brolly and a poncho anyway - because no one wants to get caught out, do they?